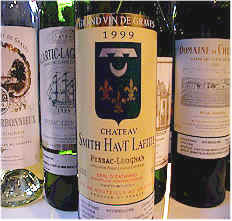 The 1999 vintage was a rather warm one for producers in Bordeaux. The total number of "degrees" accumulated during the growing season was about ten percentage points higher than normal. But the year was challenging. The growing season was also wetter than normal. During one three hour period in July, the region received something like 35% of the normal rainfall for the entire month! The weather cleared in August, coinciding with a solar eclipse. It did not rain again for about 5 weeks. The warm weather allowed the Smillon and Sauvignon to ripen and mature. 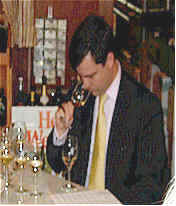 As a result, many of the wines of 1999 in this tasting are of substantial alcohol levels. The overall quality of the wines is quite high. This is reflected in the wide spread of scores, with almost every wine garnering, at least, a first place vote. Even the top wines in the "standings" had last place votes. While some of these wines cost a fortune, the good news is the quality of the more modestly-priced wines is very high. Of course, in this "modestly-priced" translates to $40. Keep in mind that second place in this tasting was only 8 "points" ahead of sixth place. That's not a significant differential. One taster described the Laville as having a "woody scent, low intensity with some fig notes, perhaps. It's a bit weak, soft in structure and low in acidity, yet aggressive." Another person felt it lacks concentration, while someone else said it has a short finish. One person found the aromas reminiscent of "cooked fresh peas and it's high in acidity, so the wine is disjointed." Another taster agreed, finding this "soft and yet sharp." One fan found persistent notes reminding him of "rose petals. There's a flowery bouquet and a bit of oak. It's smooth and velvety with a light citrus character and that rose petal quality, too." I described this wine as showing more "waxy" notes with a lanolin fragrance, the hallmark of Smillon. There's a beeswax quality to the wine on the nose and palate, with honeyed flavors that are quite attractive. It's quite rich on the palate and I found it to have a rather lengthy finish. One and a half stars (3 stars maximum, with no stars for a standard or ordinary quality wine). "This wine really improved as it got warmer, showing minerally, dusty notes and a nice crisp flavor with minerals and rich oak on the finish. It would be a really good wine for shellfish." said our lead-off batter. Another taster described it as "sharp, stainless steel...earthy and mildly grassy." A third person found it "dry, chalky and austere at first. Later it shows nice oak, displaying quite an evolution in the glass." A fourth critic found "white flowers and melon...it's a less 'obvious' wine than some of the others and is going to be a really good 'food' wine as opposed to a cocktail or aperitif white." A final word from one person was "There's more in the mouth than on the nose here." I found this to be a bit pungent and herbal. If you like German Rieslings that have notes of "petrol," you'll probably find this to be a most interesting wine. There's a piney, pungent quality on the nose and palate. I suppose this wine would really shine paired with seafood seasoned with a lot of ginger. The vineyard's 2.5 hectares of white grapes are planted with equal parts of Smillon and Sauvignon and 10% Muscadelle. I gave it a one-star rating. "This is not pleasant!" one taster told us. Another said it "has the most SO2 which it lost as it aired. I found some aromas of pink grapefruit and ginger, along with figs. The SO2 over-takes the wine. It's even a bit astringent." One panelist found it "astringent, austere and closed on the nose, but with a long finish...very focused and it's quite cellar-worthy. This tastes like the biggest wine of the group." Another person was less thrilled, finding it to be "metallic and tasting mostly of Sauvignon Blanc." A final assessment was "the persistence and structure are present in this wine." I found this to be rather simple on the nose, showing very mild Sauvignon notes and a little Smillon. 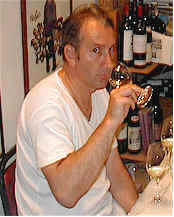 Neither variety dominates and the wine offers less distinction on the nose, but it has a bit more strength in the mouth. One star. The vineyard is 60% Sauvignon, 38% Smillon and 2% Muscadelle. "I found a nice figgy, ripe wine here. It has those same notes of figs on the palate, good structure and nice fruit." said one panelist. Another described it as "subtly vegetative. It's one of the best balanced and has nice structure." One taster encountered "nicely grassy aromas with notes of fresh limes and peas. This would be a lovely cocktail wine." Less positive were the words of another individual who found it "...the lightest wine of the group and a bit flat and uninteresting. It's citrusy and a bit sharp. Lots of Sauvignon here." Another felt it displayed the "grassiness of Sauvignon Blanc." One panelist said "It's really focused on Sauvignon Blanc. The wine is complex and a 'food wine,' having a faintly earthy finish." I found a lot of herbal Sauvignon Blanc here, with hints of white flowers and some sweet spices. The nose was very intriguing and very Sauvignon dominated. It's crisp and dry, steely-edged on the palate with good fruit notes and a touch of spice. One-and-a-half stars+. "I found this to be high in acidity and a bit volatile on the palate. It reminds me of the Domaine de Chevalier I once tasted some years ago, as it is so distinctive." said one taster. Another person found "it changed a lot as it aired and warmed. I ranked it first as it has a 'sweetness' to the fruit and showing a lot of Smillon. But now I don't care for it!" One person encountered "dusty notes with figgy Smillon fruit. It seems to have undergone a secondary, malolactic fermentation as it shows heavy, custardy lactic notes and some key lime flavors. Still, it's a bit shrill." Another person encountered "volatile, figgy, exotic notes. It's a broader tasting wine than most. Not bad!" Someone else described it as "lively, rather than shrill." I described the aromas a reminiscent of candied orange peel with intense Smillon notes. There's a hint of caramel, too, with a faintly herbal fragrance. On the palate the wine is massive, with lots of caramel and orange peel. It's mildly herbal and has a flowery note. Long finish, too. Very fine. Two stars. 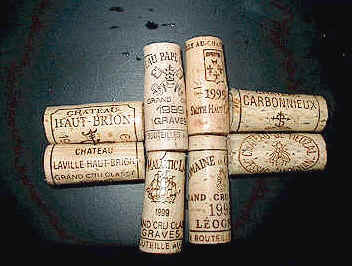 Haut-Brion's vineyards are 63% Smillon and 37% Sauvignon. "I found a lot of oak one the nose in this thin, sour, sharp wine. It's got a green apple flavor, too. My wife makes a pie of green apples and it needs a lot of sugar. This wine could use some of that balance!" said one critic. Another taster felt "it got better as it warmed. It's minerally and gravelly on the nose with tart and bitter notes on the palate. And it's a tad over-oaked." A more positive taster aid "It was my favorite wine. It shows some malolactic notes as it's creamy. There's nice oak and a candied citric quality, being mouth-filling and even elegant." Someone found "hints of honey and coconut, with really ripe tropical fruit notes." Another taster found "it's very complex...nicely oaked and not too much wood." I found it to be a nice balance of the two varietals, as each shows up on the nose but neither dominates. It's a bit warm on the palate but the flavors really echo the nose. Nice balance with a lean note of Sauvignon, countered by the weight and lushness of the Smillon. The reaction from tasters was all over the map on this wine. One taster found it "ripe...the top rated wine for aromas, but it's fat, warm and empty." Another marked it down for its "hot finish," while someone else found "green apples and Smillon." 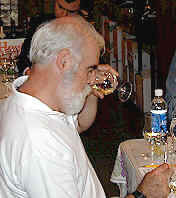 Another fellow found it "evolved quite a bit showing an oaky nose at first with a buttery quality on the palate. But the oak has subsided and it now shows citrusy, lemony notes and a hint of a soy-like flavor." One taster encountered "dusty, floral notes with geraniums and some grassy flavors and a limey finish." Another panelist felt it to be "a little bit raw, but it will age nicely." Being a fan of Sauvignons from Sancerre, I really enjoyed the intensity of the Sauvignon aromas. It shows a hint of pine, herbs, stalky, citrusy notes with a touch of peach. It's dry, crisp and tangy on the palate. I think it's a superb candidate for shellfish. Two to two-and-a-half stars. The vineyards at de Fieuzal are half Sauvignon and half Smillon. "I found this to show notes of yeasty, bready characters on the nose. There's a hint of sour pickles and it's got a crisp, yet oily mouth-feel with a metallic, bitter edge." said our lead-off taster. Another person detected "a strong aroma of bread, yeast and popcorn. It's a big, burly wine with lavishly bready aromas and an intriguing nose...very interesting and complex." Someone else found "big, rich, oaky, vanillin notes, but it doesn't have a lot of fruit on the palate." A few tasters found more curious elements here. One said "It's got a bizarre character with hints of onions and garlic and maybe even kim-chee. Even so, I liked it." Another person didn't have much good to say in describing the wine, finding it to be "skunky and reminiscent of cabbage." I found a lot of leesy notes here, the elements that others described as bready. It's quite stylish and complex on the nose, with a bit of oak, toasty, smoky elements. It seems more advanced than the other wines, probably a result of the maturation period in wood. It's crisp, full and really nice with stony, pineapple-like flavors and the toasty notes of the time on the spent yeast. Very complex. Two to two-and-a-half stars. Smith Haut Lafitte is planted with 95% Sauvignon Blanc and 5% Sauvignon Gris.